SynergyAIR Power Tower Rental - Get Yours Today! Easily equip your gym with the SynergyAIR Power Tower. One of the most versatile, effective and best loved HIT machines out there. The most versatile fitness climbing machine ever built. The low footprint SynergyAIR Power Tower is now completely affordable! Provided stock and labour demand is permitting, we could have your SynergyAIR Power Tower installation in under a week from decision! Built for today’s discerning fitness clientele, the SynergyAIR Power Tower gives your customers what they want – something different, something engaging, something versatile, something that works and something bang on trend. An important aspect of training on the SynergyAIR Power range of conditioning ergometers (Power Tower, Power Climber, Power Cycle, Bionic Power Cycle and Power Swimming & Board Paddling Erg) is developing a clear understanding of the unprecedented training potential. This is facilitated by our revolutionary patented system of coupling air displacement dynamics with a Continuously Variable Transmission (CVT). Using an air displacement turbine or flywheel as a form of resistance in exercise equipment was first patented by Repco in Australia on their Bionic Bike and Cycle ergometer way back in 1979. It was later used by Schwinn, under license from Repco, on the original Schwinn AirDyne. It was also adopted by Concept2 on the model A rowing ergometer in 1981. However, we have seen a resurgence in recent years in the appreciation and popularity of working against air on exercise machines. It not only does it offer a more authentic and smooth feeling form of resistance, but it also provides considerably higher degrees of potential load to work against when compared to traditional electronic, magnetic or motor driven fitness equipment. This is not the case with an appropriately geared air displacement system, especially when coupled with a CVT gearing system, where the only limiting factor is human capacity. When force is applied, Air, reacts like a fluid. What makes fluid dynamics unique is the cubed relationship between incremental changes in power output and speed. This is very different to what you experience when working against frictional resistance experienced when running on a treadmill, or training on an exercise bike, or elliptical cross trainer the use various forms resistance. When you run on a treadmill, or ride most exercise bikes, there is a linear relationship between power output and speed, so if you double your effort, or power output, then you also double your resultant speed. The unique nature of fluid dynamics means that when you work against either water (e.g. swimming, rowing, kayaking), or air (air displacement ergometers), if you want to double your speed, then you actually need to increase your power output by a multiple of eight. You need to cube (i.e. express to the power of 3) the incremental change in speed (2 x 2 x 2). Likewise, it takes 33.1% more power just to go 10% faster (1.1 x 1.1 x 1.1 = 1.331). The cool thing about coupling a CVT with an air displacement turbine is that we are able to produce totally insane resistance levels without the speed of movement ever remotely becoming the limiting factor. The CVT used on the SynergyAIR Power range of ergometers allows a gearing ratio change by a multiple of almost four (3.9 to be exact). We are are therefore able to produce both extremely low and extremely high levels of resistance at both very slow and very high speeds of movement. When we multiply the cumulative effect of changes in movement speeds by the gearing changes and then cube the sum of those figures, we can potentially create some unbelievably staggering numbers. Whilst on our bikes we keep the gearing down to a relatively sedate level (see table below), to appropriately cater for the full range of small, large, beginner and advanced users, we let our freaky capabilities free to fly a little more on our Power Tower and Power Climber. Conventionally, international brand exercise equipment manufacturers rate the maximum watts capacity of a bike or an elliptical at 150 rpm, or 150 movement/stride cycles. So typically the three major international brands (Life Fitness, Technogym and Matrix) all have max power outputs on their cycles and elliptical at around 650 watts. 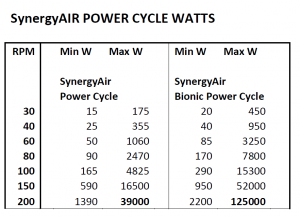 In the table below, you’ll see that whilst we can still provide very low watts resistance on the minimal gearing setting on our SynergyAIR bikes, we achieve massively higher numbers at the top end of the gearing range. Whilst even the best cyclists in the world obviously aren’t capable of achieving anywhere near these sort of maximum power outputs, what it does mean is that you have the option to use a big gear and get out of the seat and realistically simulate the most challenging hill climbing scenarios, or even simply do some super effective strength endurance training, grinding away at a very big gear, at a very low cadence. We advertise the max watts @ 150 step/stroke cycles on the Power Tower as well over one million (1M) watts and on the Power Climber as over 1.5M watts. Now obviously no-one is powerful enough to achieve these astronomical and seemingly unbelievable power outputs, because at maximal possible gearing levels the resistance is simply too heavy for anyone to be able to achieve anywhere near 150 step cycles per minute at a full range of motion. Believe it or not, these are actually extremely conservative measurements, based on a perfectly even paced speed of movement, with no degree of acceleration at the max stroke rate. When acceleration occurs during the stroke rate, replicating stroke power indexes (SPI) achievable by the best athletes, then these numbers get much, much bigger. Once again, whilst these high figures not remotely humanly impossible, we hope to clearly demonstrate the fantastically incredible power producing capabilities of our patented technology of simply coupling a CVT. This is due to an air displacement turbine and maximising the naturally inherent physical properties of fluid dynamics. This facilitates extremely effective strength training, as well as optimal total body speed, power and aerobic/endurance development in a wide range of very functional compound movements targeting every muscle group in the body. Our agreement with Rent Gym Equipment Ltd. has removed the price barrier. With low monthly costs and no lengthy credit checks to set up, renting a SynergyAIR Power Tower has never been easier – in fact its never even been possible before now! It’s time to take advantage of it.